Kim Hollis: How much do you think the free Us Weekly press surrounding Vince Vaughn and Jen Aniston helped the performance of The Break-Up? David Mumpower: I feel certain it's the difference between an opener in the mid-teens versus an opening approaching forty million. As Reagen commented earlier, this was the perfect project to capitalize upon Aniston's heartbreak for career gain. Reagen Sulewski: Undoubtedly. They should hand People magazine an assist on this one as well. Kim Hollis: Honestly, I attribute the success a lot more to goodwill for Vince Vaughn than sympathy for Aniston. After all, it didn't particularly help Derailed or Rumor Has It, and she was just as much a presence in the rags at that point as she is now. Tim Briody: I agree with Kim. She's had romantic comedy success too with Along Came Polly, a huge hit for a January movie. Kim Hollis: This leads to my next question. 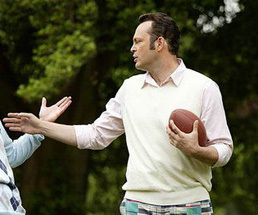 Is Vince Vaughn really a box office draw or has he been ridiculously lucky in picking projects lately? David Mumpower: I would maintain that his decision making in picking projects is what has made him a star. He has now built up the sort of trust from audiences that a box office opener needs to get the top projects. As I said in the Friday Numbers Analysis column, I think he's the new Adam Sandler. He's done his time and is now starting to reap the rewards. Kim Hollis: Indeed. I would say that rather than being ridiculously lucky, he has been ridiculously savvy. And he's given himself space to do the occasionally indie flick like Thumbsucker along the way. David Mumpower: Putting it another way, Vaughn is what people thought Will Ferrell would become. The talent level is similar. The difference between them is career choices. Tim Briody: So then the conclusion is for Vince Vaughn to avoid remaking Bewitched? Reagen Sulewski: When the producers for I Dream of Jeanie come along, pretend you don't speak English. Kim Hollis: Relative to expectations, which of the three recent performances - The Da Vinci Code, X-Men: The Last Stand and The Break-Up - is most impressive? Reagen Sulewski: The Break-Up, though it shouldn't come anywhere near the totals of the other two. X3 is about where I would have called it after ten days, and Da Vinci is about $30 million low for my 17 days thought. David Mumpower: That's a tough question. All three have been fantastic initial performers. We know that the first two failed in their second frames while we don't have that information for The Break-Up yet. I'm inclined to say X3 since you can't argue with the fourth largest opening of all time. Tim Briody: Relative to expectations, The Break-Up, hands down. David Mumpower: Reagen makes an interesting point about X3. If you take out the opening weekend success and second weekend tragedy and simply look at the ten day numbers, it's about where people expected. What has been shocking has been the erratic nature of its box office ride. Tim Briody: We know we're in the age of "huge opening, no legs" when it comes to blockbusters, but X3 is the most extreme example ever. Kim Hollis: I'm going to hedge my bets and say that the only one that might *not* be impressive is The Da Vinci Code. I always expected it to be massive, but the fact that it's a stinker is going to affect overall totals to a detrimental degree. X-Men should at least stay within expectations, and The Break-Up is already ahead of the game even if it does have a tough drop in weekend two.